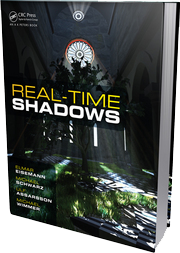 Just a quick post to recommend you the great book "Real-time shadows" that details, explore and greatly explain a large number of relevant techniques for real-time shadow rendering, which we all know must be one of the most prolific field in computer graphics ! In addition, this book is written by 4 leading experts of the field: Elmar Eisemann, Michael Schwarz, Ulf Assarsson and Michael Wimmer. For me, it is now THE reference on shadows rendering ! More info on the book website. and a good description on the publisher's website. Of course it can be bought on amazon. 0 Comments for "Real-Time Shadows Book"